Today we went apple picking at Davis' Farmland. We still had a gift certificate so this was a perfect opportunity to use it before it expired. After explaining to Meghan that we pick the apples off the tree, not off the ground, we had a great time. Sean kept picking the apples up off the ground, saying "ball", and then throwing them. But it kept him happy. The tree were loaded with apples. It took us no time to fill up our bags. We probably could have picked them all off one tree if we wanted. Next time we will definitely bring our wagon instead of Sean's stroller. Now I am off to figure out how to use all of these apples in recipes that do not contain butter or milk or cheese. I definitely plan to make this one and will do so as soon as I can go buy some more eggs. Don't ya love Fall! 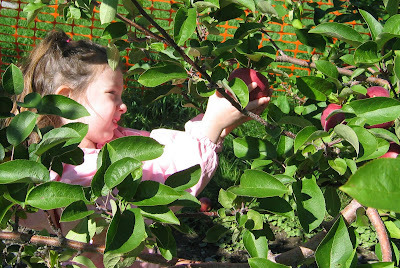 I can't wait we are going apple picking tomorrow at Honey Pot Hills with a group of 25 people. Should be fun. 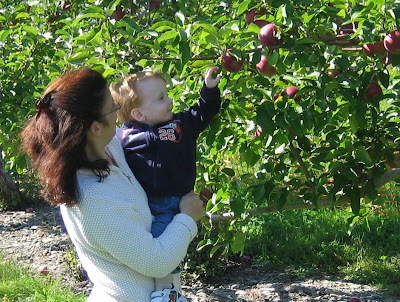 I love taking my kids to the orchard! We've gone to several already this year.